Monin has captured the taste of this succulent dessert, the brownie. 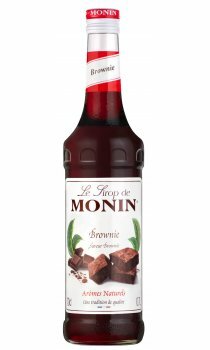 Monin Brownie syrup features a super rich, fudgy chocolate confection enriched with a buttery walnut nose and aroma. Monin Brownie syrup is the perfect re creation of this amazing cake to widen the options for indulgent beverages rangi ng fro m lattes, to hot chocolates and even gourmet smoothies.